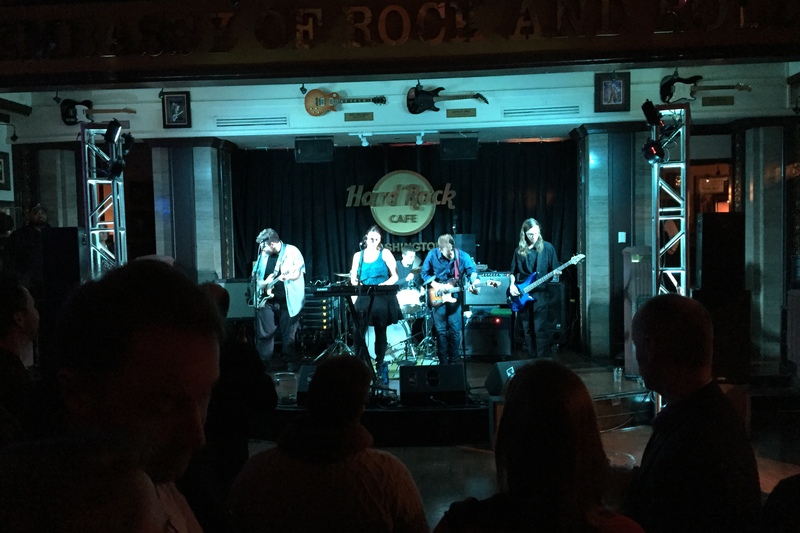 Local news media held their annual Journopalooza – Battle of the Media Bands – at the Hard Rock Cafe in D.C. 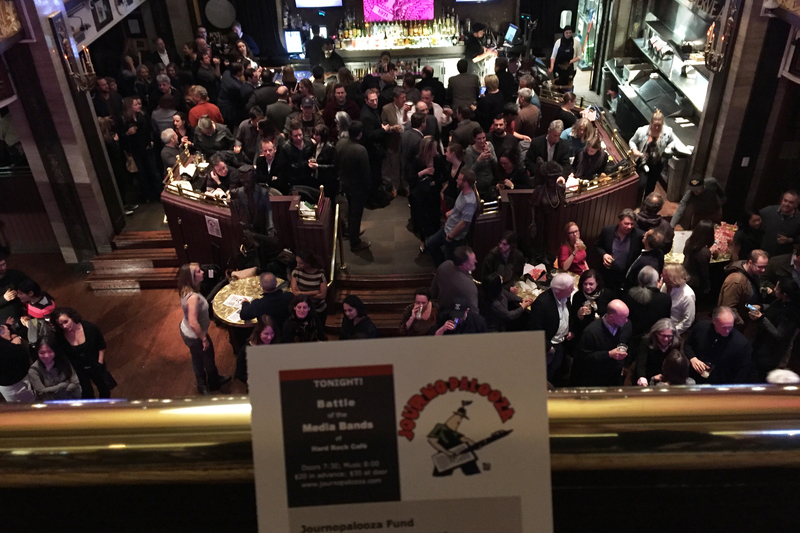 Translated that means that a solid crop of Washington’s reporters, editors, television people and more came together to drink, socialize and dance for a good cause: supporting journalists in danger zones, conflict areas like Syria. The $20 (over the Internet)/$30 (at door) cover charge and any donations went to the Committee to Protect Journalists and Reporters Without Borders. The bar was packed by a crowd whose ages ranged from the early twenties to their sixties. Beer and drinks flowed. Boxes of french fries were sold, free ketchup packets on the side. The conversation was mostly conducted by gestures since the music was so loud it was doubtful that you could hear anything being said. Bands scheduled to appear were Nobody’s Business, Hot Pocket, Notaries Public, Shark Week, Suspicious Packages and The Nativemakers. Journalism as a profession is in massive flux as old media twists and turns its way into a digital medium. Nicco Mele at the USC Annenberg School of Journalism points out that “some outlets are seeing the largest online audiences they have ever had, revenue is still shrinking.” This means fewer journalists on the beat. 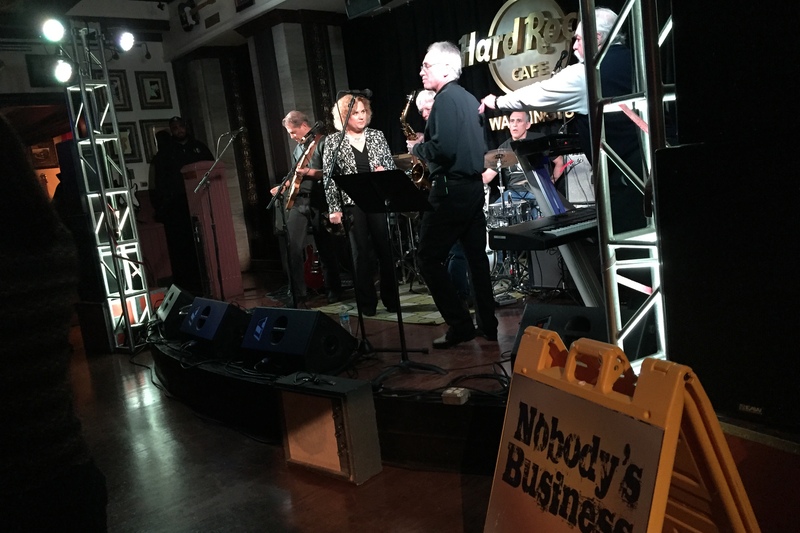 On Friday night at Journopalooza, everyone was rocking down to the music efforts of hard-working journalists some of whom might not have a job on Monday morning. This was pointed out by a writer from Al-Jazeera America, who pointed out that it will cease to be a network on April 30, 2016. Journopalooza started in 2009 with a concert at the National Press Club. Anyone interested in the Journopalooza Fund should contact Christina Davidson at Christina@journopalooza.com. This entry was posted in 2016, Journalism and tagged Journalism, Journopalooza, music, Washington D.C.. Bookmark the permalink.